I would recommend this book to high school level readers. It is pretty interesting, though it is not a quick read. The story revolves around a boy named Ranofer who becomes involved in theft, specifically, the robbery of a royal Egyptian tomb, a crime carried out by his half-brother Gebu. 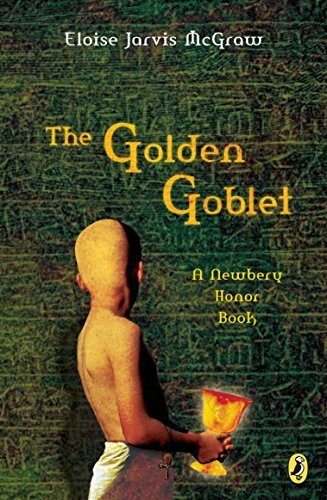 In searching for an image for the cover of the review, I saw that somebody had reviewed The Golden Goblet saying that it was terrible and that the plot took too long to become interesting. I suppose many people today cannot persevere in some things, such as reading certain styles of writing. But critics loved McGraw's novel, and it received a Newberry Honor award. I was required to read it in a high school literature class a few years ago, but I enjoyed it for the most part. When they were asked, all of my friends admitted they liked it as well. The Golden Goblet is a book written by Eloise Jarvis McGraw; it concerns an Egyptian boy named Ranofer whose world takes a bad turn once his father is deceased. Ranofer is put in the keeping of his older half-brother Gebu, who he grows to hate quite strongly since Gebu mistreats him often. Ranofer catches on that Gebu is stealing gold, and he has to find his courage. It is a great story which involves a child's dream which is denied to him for a long time and is finally achieved after much suffering on his part. It is also a story about growing and strengthening friendships. Besides the virtues that could be found in its pages, the book has numerous historical values and references. It makes a brief reference to the Egyptians' trade with the sea-faring Phoenicians. The typical Egyptian daily diet and ancient religious beliefs about the afterlife are noted. The main story takes place in the city of Thebes. The historical figure Queen Tiye, the grandmother of Tutankhamun, appears on the scene late in the novel, thus pinpointing the general timeline of the story to be somewhere in the 1300's BCE. Jewelry-making, Egyptian grave robbers, and punishment of such criminals are obviously important elements of this story too. McGraw, Eloise J. "The Golden Goblet." Ancient History Encyclopedia. Last modified May 29, 2017. https://www.ancient.eu/review/164/. McGraw, Eloise J. "The Golden Goblet." Ancient History Encyclopedia. Ancient History Encyclopedia, 29 May 2017. Web. 23 Apr 2019.